The Social of the Year! Members of the DUA organised a social which was held in the Snack Bar in Queen’s Students’ Union on Tuesday 15th March. The event proved to be a huge success, with almost 200 in attendance! The social included a demonstration of Scottish Country Dancing as well as the usual social line dances and games, and a gospel message in the epilogue. We will be making a donation to the Royal British Legion charity from the proceeds of this event. Posted on 18th March 2011 Author Mark WallaceCategories UncategorizedLeave a comment on The Social of the Year! 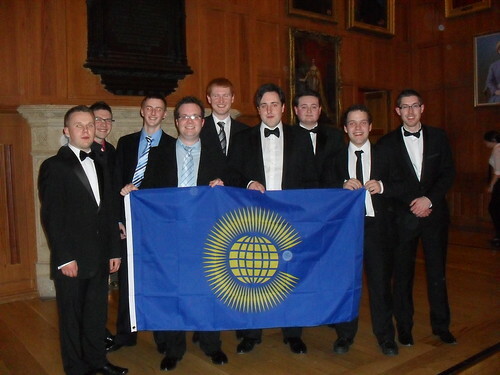 A special function was held in the Great Hall at Queen’s on Monday 14th March to mark Commonwealth Day 2011. The event was organised and promoted by student societies at the university, including the DUA. Many international students from Commonwealth countries were in attendance, as were many distinguished guests including ambassadors, MLAs, the Vice-Chancellor and other members of Queen’s staff. As well as enjoying a superb meal, those present heard speeches from Lord Rana and William Hay MLA, Speaker of the NI Assembly and President of the Commonwealth Parliamentary Association. Both men spoke on the theme for this year’s celebration, “Women as agents of change”. A selection of musical entertainment was provided and a medley of patriotic tunes including “Rule Britannia”, “Land of Hope and Glory” and the National Anthem was certainly a highlight in what was an enjoyable evening. 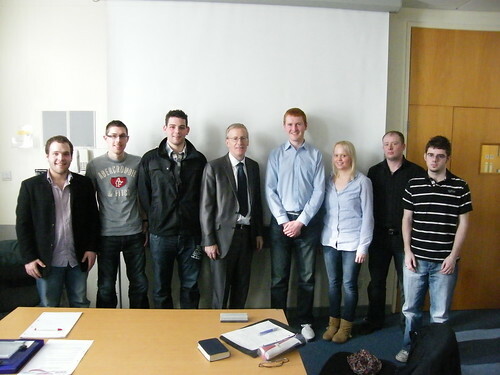 East Londonderry MP Gregory Campbell visited Queen’s last Tuesday as guest speaker at our monthly Association meeting. 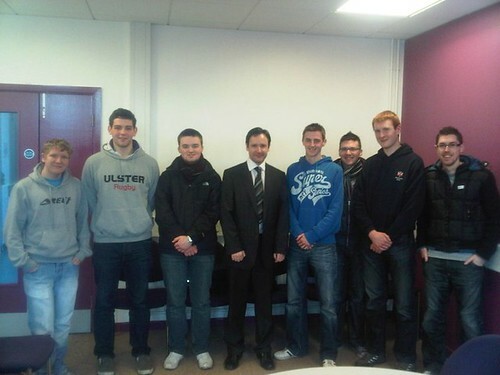 Mr. Campbell spoke on the current political situation in Northern Ireland. 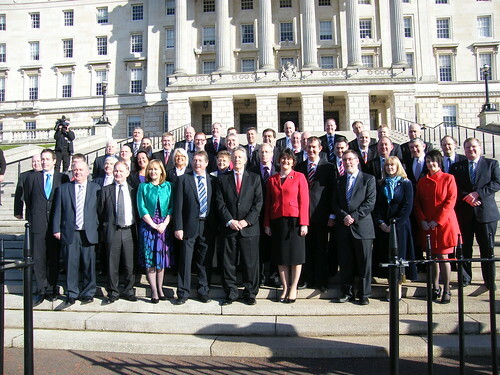 He explained that whilst some in our society claim that nothing has changed politically over the past few decades, and the approach of others is to forget the past and pretend that all has changed, the DUP approach – recognising that the challenges of today aren’t the same as the challenges of the past, but that we need to be ever mindful of our opponents’ ambitions – is the correct one. Mr. Campbell also spoke on the vital upcoming Assembly and Local Government elections, as well as the DUP’s priorities for the next term of the Assembly. This was followed by a question and answer session with members present. We thank Gregory for taking the time for taking the time to speak to us. “The DUP is offering a very strong slate of candidates throughout Northern Ireland in this crucial Assembly election. I am particularly pleased that we have a strong mix of experienced public representatives and new candidates to offer the electorate. The emergence of new candidates is reflective of the way in which the DUP is expanding to bring new people in to front-line representation. They all have very strong roots in their communities and a capacity to really influence things for the better. On 5th May voters will have a choice to make. We can move forward and build on the progress of recent years or we can be dragged backwards to instability and conflict. We want to build on progress so far and ensure that Unionism retains its leadership role in the Executive. Every vote will be vital and we’ll be working hard to engage people who have never voted before or who feel elections don’t matter. This election will be focused on the economy and which party can provide policies to steer us through the massive cuts being handed down to the Executive by the Conservative/Liberal Democrat government. Despite the £4billion cuts to our budget, we are a low tax party and will be offering policies to keep household bills low whilst creating the conditions to help business flourish. The DUA, along with members of other student societies at Queen’s will be joining in celebration of International Commonwealth Day 2011 at a gala banquet to be held in the Great Hall. This is the first event of its kind at the university and we invite you to join us. “We need a richly educated population not an educated rich. The DUP is proud that Northern Ireland holds the British record for the greatest number of people from a less well-off background accessing university per head of population in the UK. Northern Ireland will be best served when we balance the twin aims of ensuring and protecting access to university on the ability to learn while resourcing our British universities adequately to compete at the world class level. I accept the thesis that those who out-educate us today will out-compete us tomorrow. It is vital that employment and learning remains at the heart of a jobs led economic recovery. DUA members heard a talk on Unionism and civil society at the February meeting of the association from former Queen’s student and Northern Ireland’s newest councillor, Mr. Stephen McIlveen. Stephen has recently been co-opted to Ards Borough Council to represent Newtownards DEA. He was also appointed as a commissioner last year to the Equality Commission for Northern Ireland. In his address Stephen explained his role on the Equality Commission and spoke about the wider structure of quangos in Northern Ireland, particularly about how the Protestant/Unionist/Loyalist community is under-represented on many of them and stressed the importance of Unionist input to these organisations. A discussion on this subject and other issues followed. Pictured below are some of those who attended with Cllr. McIlveen. “The University of Dundee has always had a significant number of students from Northern Ireland, and whilst they will be keen to hear why their future lies in their home country, students from elsewhere in the UK and international students will also have the opportunity to ask questions on the DUP vision for the Province. The reality for many students from Northern Ireland who studied in GB is that they never returned home, and instead their knowledge and expertise was lost. The ‘brain drain’ is an issue that we have sought to address by ensuring that we create the conditions that allow for economic investment, and as a result we can attract the kind of jobs to Northern Ireland that will attract our graduates home. The event will also focus on how much Northern Ireland has benefited from devolution, and on what changes we would like to see in the structures at Stormont, so that we can move towards a more efficient and effective type of governance. “DUP MPs will be voting against the Government today in an attempt to stop their ill thought out proposals to increase tuition fees which will have a detrimental impact on the growth of the NI economy and that of the whole of the United Kingdom. We recognise the importance of higher education which improves the skills base of our economy; attracts inward investment and promotes research and the opportunities that come from that and we must not put that at risk. However not only will it have a detrimental impact on our economy but it will also put higher education out of the reach of many. Indeed the Government has clearly recognised that increasing fees will have a negative impact on those from less well of backgrounds and will make them more reluctant to take up higher education opportunities. This is not acceptable. Our view is that people should obtain higher education not on their ability to pay but on their academic ability. Any decision made at Westminster will of course affect Northern Ireland policy and there have already been financial consequences and a budget reduction of tens of millions of pounds based on the assumption that this bill will be passed by the House of Commons tonight. People in Northern Ireland should be mindful of the fact that had our own Employment and Learning Minister been successful in his bid to be elected as a UCUNF MP he would have been whipped in to supporting these regressive measures. We believe that investment in Higher Education is of strategic importance to the growth of our economy and if there is a funding problem we should first of all look at how the cost of universities themselves can be trimmed. Inflated costs must not be passed onto students but instead universities should look at how they can be more efficient and how they can trim wasteful expenditure and some areas of spending.